This page may require cleanup to meet basic quality standards. The specific problem is: requirement table is still a mess, mostly because of non-standard listing of requirements.. You can help by modifying the article. The discussion page may contain useful suggestions. 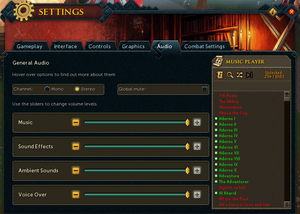 This page is for updated version, commonly called RuneScape 3. For re-release of the 2007 Java Client, see Old School RuneScape. Originally launched January 4, 2001 for web browsers. 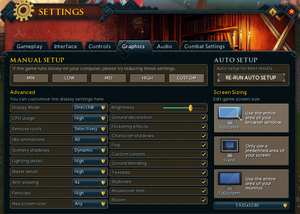 All versions require a Runescape account and a constant internet connection for all game modes. Newest client natively supports all platforms but legacy client does not support linux natively. Browser based version works with any OS that has browser with Java plugin (does not work with Chrome, Firefox or Edge). Cache files are stored in %PROGRAMDATA%\jagex\runescape. 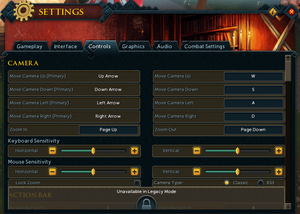 Progress and stats are saved automatically to Runescape account. As of april 2016 NXT update fullscreen is available for everyone. Interface does not scale in the current version. Better support is planned. Fullscreen option on new client is borderless windowed. On legacy client it is exclusive fullscreen. New client has no frame rate cap. Java version is capped at 50 FPS. New client has no frame rate cap. Music, effects, ambient and voice over. Majority of speech is text. Selectable from options in the Java client. Defaulted in Windows (enabled as a failsafe in NXT). 2.0 Selectable from options in Java, default in NXT. Select Safe Mode from in-game settings. For fully detailed requirement list, see the official system requirements. OS X 10.5 64-bit requires the downloadable client. Hardware rendering requires GPU with at least 128 MB of VRAM.